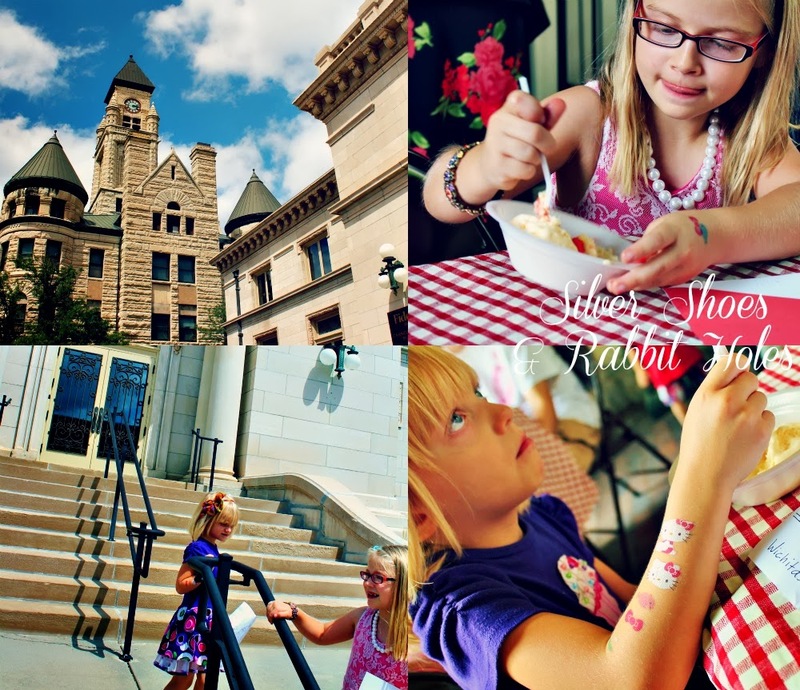 This weekend, our city celebrated its 143rd birthday, and our local historical museum decided to throw a birthday party! 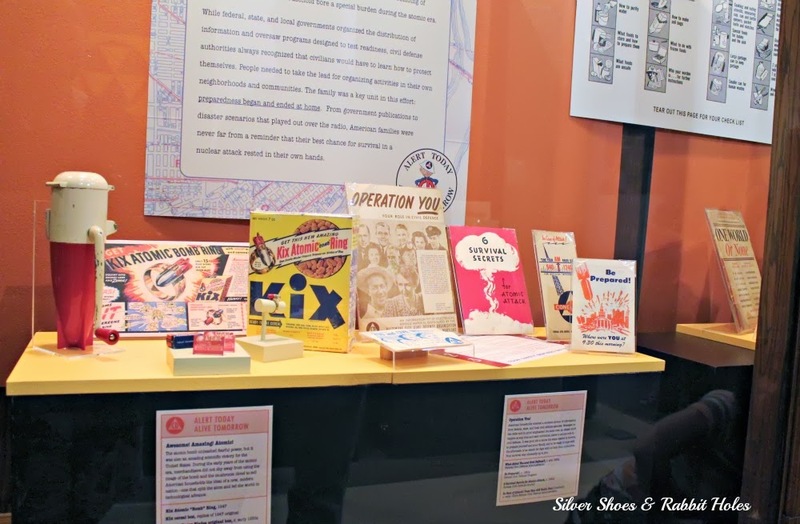 Admission was free with a birthday card - we're members, and get in free anyway - and there were cupcakes and ice cream upon exiting, as long as you wrote down a fun fact about Wichita for a post-it board they were putting together. 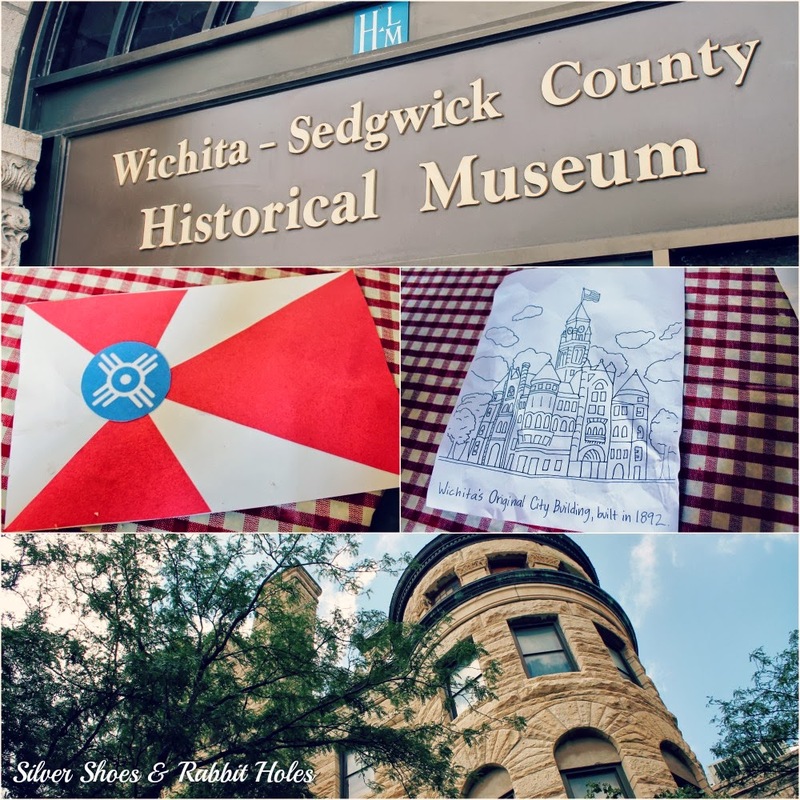 The entrance to the building on Main Street; Big Sis made a Wichita flag; a coloring sheet for Little Sis to bring home; the back of the building. 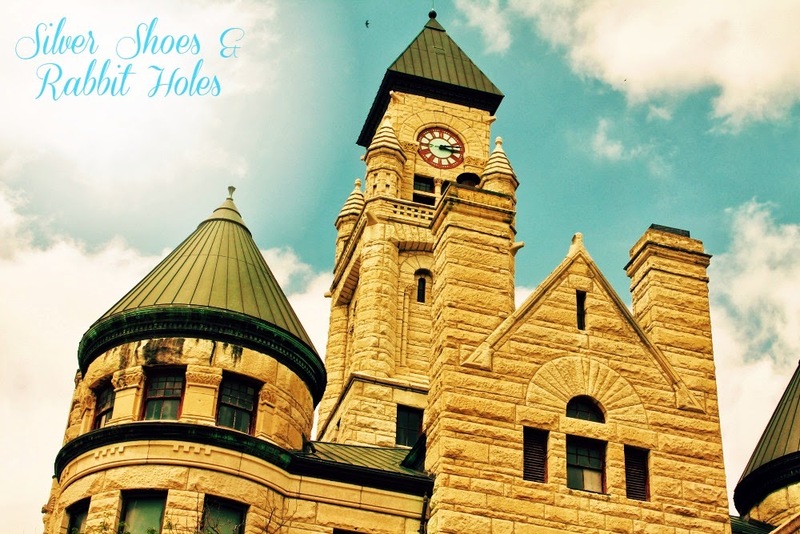 The historical museum is housed in the old City Hall, designed by famed architecture team Proudfoot & Bird. It was built in 1892. The museum moved to the space in the 1970s. While this has long been my favorite building in town, I didn't step inside until a couple of years ago! (Well, not counting a fifth grade field trip. I don't remember much about the museum from that day. I do remember that we ate McDonald's in the park behind the museum, then headed over to the planetarium next door, which was much more exciting.) 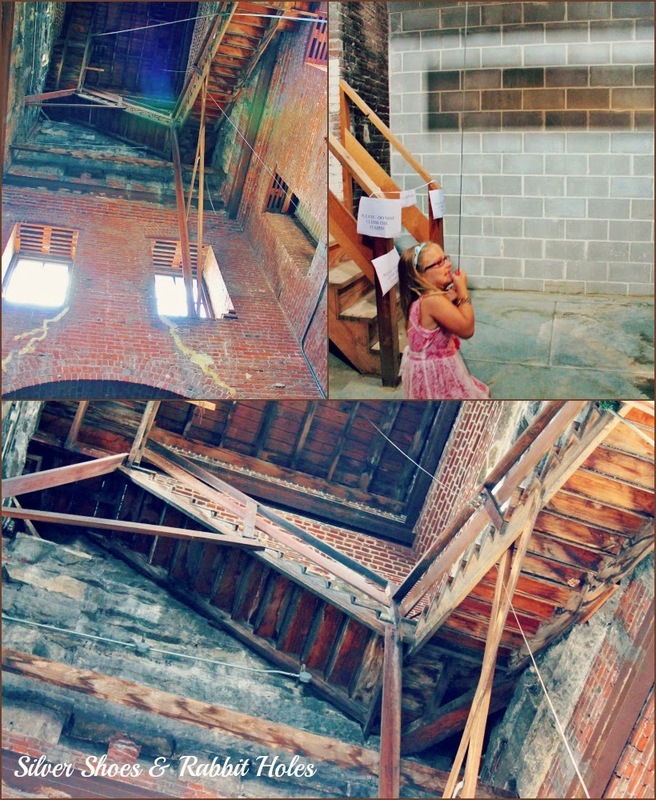 Two summers ago, I brought the girls to tour the museum and they loved it so much, we became museum members. The girls have the permanent exhibits memorized. They know what floor everything is on. It's always such a joy to visit. And Mr. B was off work this day, so he got to accompany us! Look at the box of Kix! The girls love the children's areas. 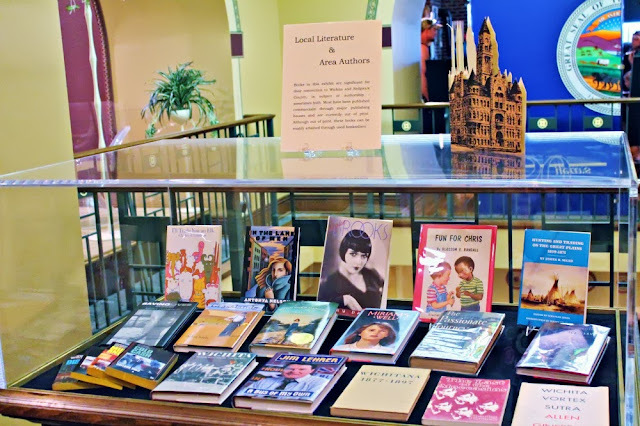 There's a whole section on the second floor devoted to childhood. For special events, they have a hands-on area set up across the hall. 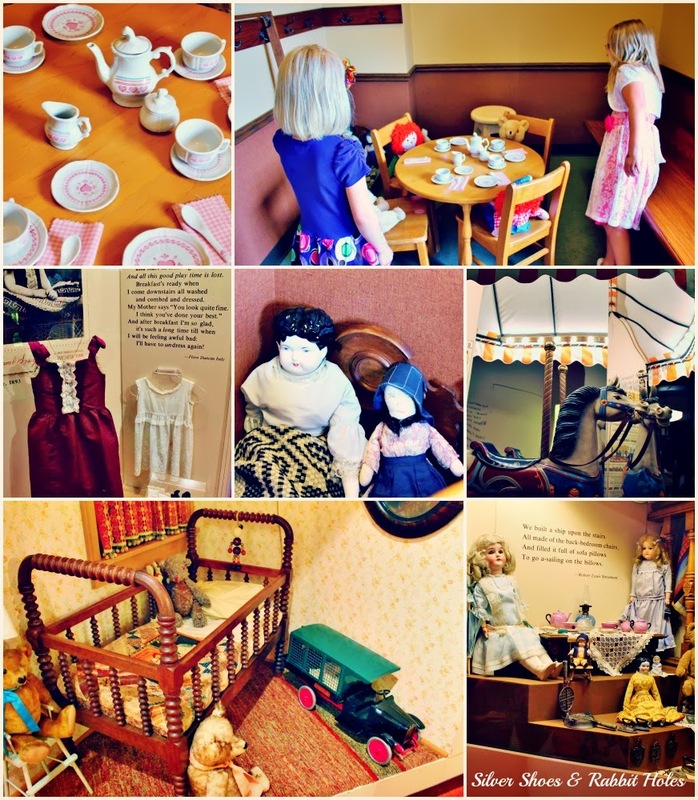 This weekend, they had the tea set and some dolls, along with coloring and crafts. 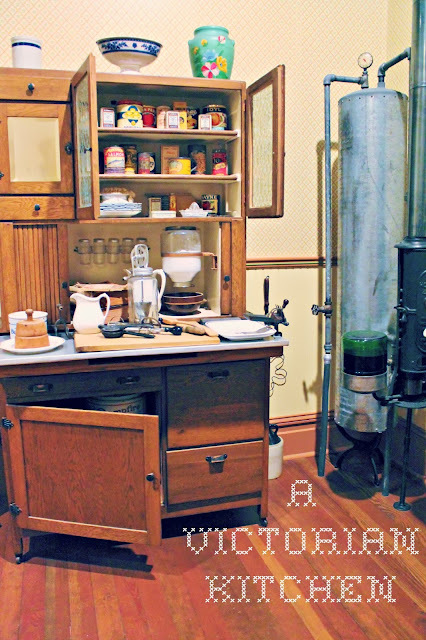 We also love the Victorian cottage exhibit, which walks you through all the rooms of a fine Victorian house. 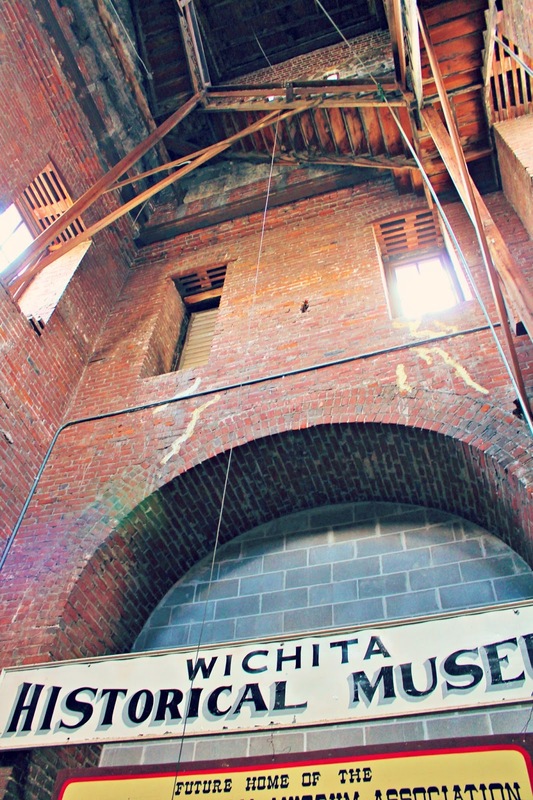 A look at some books by authors from the Wichita area, and/or about Wichita figures. The part of the tour we were most excited about, though, was a trip up the stairs beyond the fourth floor. While the tour did not lead you up the narrow, rickety stairs to the actual clock tower, it did take you up to the bottom of the tower. 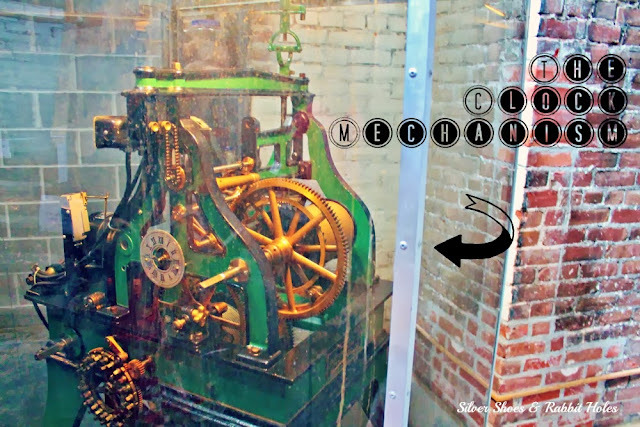 There you could see the clock mechanism - the clock wasn't added until the 1910s - and you could pull a rope to ring the bell! We also saw the original "Future Home of..." sign. The building next door to the museum - the one with the stairs the girls are standing on - is the old Carnegie library building. When I was a child, it was the Omnisphere, a planetarium. I took a field trip to that building every year from first to fifth grade. Now, it's a bank, although the bank has restored it closer to the way it looked in its library days. The actual main branch of the library is now housed across the street. The city is in talks to build a larger, new library elsewhere now. Are your children interested in history? Are there any cool historical museums in your area? Wow... THAT is a museum, friend. My girls love history, specially biography. I don't know of a museum like this you have, but I know there must be some places to get a bit of history. 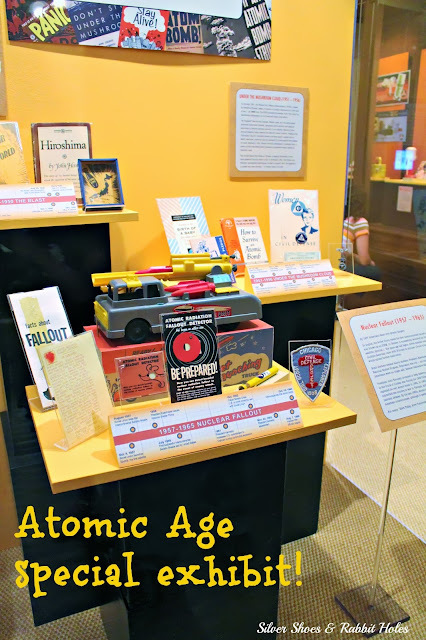 Not long ago, though, we went to the National Pacific War Museum, LOL, and they saw a replica of the two atomic bombs (oops, the museum is about WAR), but not only, we saw the hotel and house of Almirant Nimhs, and before we went to Washington at the Brazos and visited the historic house and surroundings of Ansel Jones, last president of Texas as a country, and we got some Alamo and Declaration of Independence history... hmmm, we don't fair that bad. 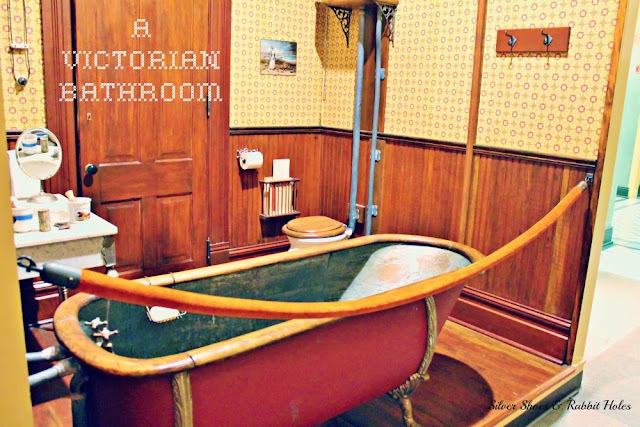 But that victorian kitchen and bathroom... oh, I remember, we saw the most amazing Titanic exhibit, but only hubby and I. I wish the girls would have come to that one! I actually told my husband not to explain the Atomic Age exhibit to the kids. I remember seeing the TV movie The Day After when I was a kid (first grade, I think?) and it seriously freaked me out. (It didn't help that much of it took place in Kansas!) I was a worrier, and the girls tend to take after me. I love those type of museums! So much to look at and to learn from. I wished I could see that from up close! The childrooms and Victorian kitchen in particular. Thank you for sharing your pictures! Thank you! 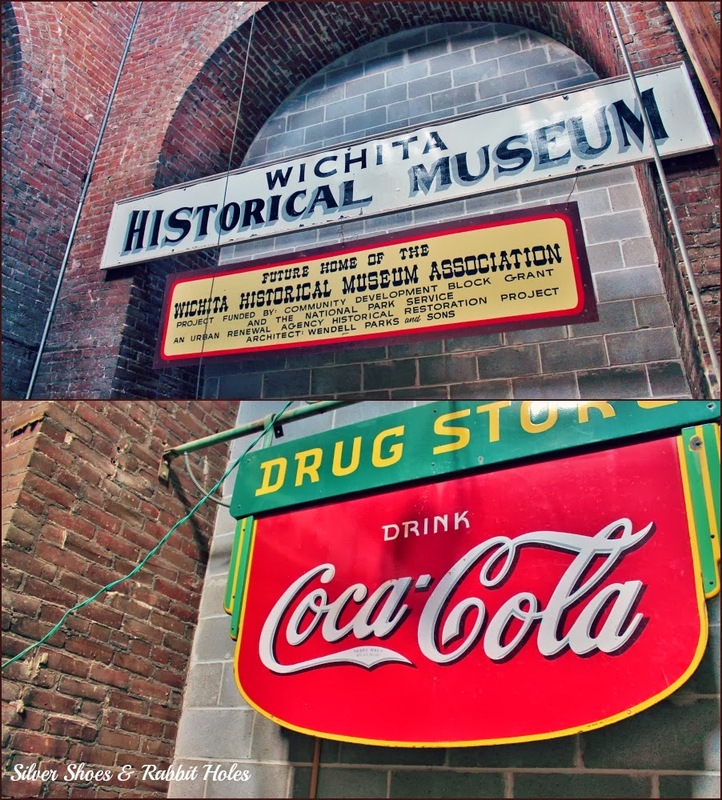 I love to go to smaller historical museums, too, just little exhibits of things the locals are proud of. I do think our huge museum is pretty awesome, though. I don't even know if there are any cool museums like that near us? How sad is that?? I know the Wiki lists are not complete. I know of at least one small county historical museum, for instance, that didn't make the list for Kansas, but you know, it's a start!